Chronic back pain can have a seriously detrimental effect on your everyday life making even the simplest of tasks such as housework, driving, picking up your child or even dressing almost impossible. This debilitating condition can also lead to over-reliance on strong medications and even cause depression. However, there are natural and simple measures you can take to help ease the pain, strengthen your back, and improve your overall health. Here’s what you can do to help your back. One of the most simple and obvious ways to help your back is to correct your posture. Many people slump in front of the computer, lounge on the sofa and walk with shoulders hunched – and they’ve been doing it for years! By learning to sit and stand up straight, working your abdominal muscles to relieve tension in your spine, pushing your shoulders back and keeping your head up, you’ll take a great deal of pressure off your back. Even just 5 kilograms extra can put strain on your back. A nutritious diet and gentle exercise will not only ease back pain, but will make you feel better and give you more energy. Pilates and yoga exercises are suitable for all ages and abilities. Low impact exercises will stretch your muscles and strengthen your abdominal core, putting less pressure on your back. Smoking obstructs essential blood and oxygen flow, causing problems with discs that cushion your vertebrae. Lung congestion can also create upper back pain. By stimulating key pressure points and triggering the body’s natural painkillers, Acupuncture can improve the body’s function, ease pain and promote natural healing. 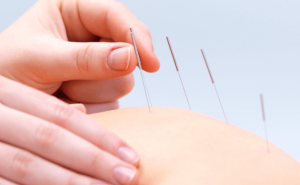 Many patients find that acupuncture is more effective than many over-the-counter medicines. Acupuncture can also help with weight loss and smoking cessation. For more information, contact Acupuncture That Works today on 0800 051 76 88.